A number of years ago Healthy Options and their sister company Wildwind Sailing Holidays placed an advert for a someone to teach their staff a little of the local language. The advert was answered by man called Aris and shortly afterwards Aris and his wife Brigette met with Varvara and Simon (the founders of Healthy Options) and invited them up to their home in the mountains. They drove for nearly an hour through some of the most spectacular scenery on the island and then arrived at the house to be greeted by the scent of beautiful smelling herbs and flowers and rows of pots filled with tinctures of remedies. Aris and Brigette talked with great enthusiasm about their lifestyle and how they lived with the seasons and nature as much as possible, mainly eating what grew near to their home and finding remedies for all kinds of ailments amongst the wild plants of the area. They also chatted about how they ran tours around the local area to groups of tourists. These tours were aimed at encouraging city dwellers to get back in touch with nature. During the tours Aris would show them how easy it is to live off the land and how with every footstep you take there is usually a herb or flower you can eat or make into something that would treat an ailment or have great health benefits. Soon afterwards Aris began running the first of the Healthy Options Herbal Walks. The Healthy Options group were taken to up to the mountains where they spent the day walking and finding plants and herbs smelling them, tasting them and visiting the herbal drying room. The day was rounded off with a visit to their friend Maria’s taverna, where alongside the wonderful fresh, seasonal food, the guests also enjoyed lots of local wine before being driven back to Vassiliki with the feeling that they had travelled back in time for the day. Maria’s Taverna is a hidden gem in the mountains with only a few tables and a tiny kitchen, but the food is exceptional, perhaps because it is all grown on site in Maria’s garden and most of what you find on your plate has been picked or harvested that very day. If you would like to experience some of Maria’s fantastic food during your stay with us, her taverna is well worth a visit. Despite its humble size the taverna was previously voted in the top 3 tavernas in Greece and appears in the Lonely Planet guide. 13 years later and The Healthy Options ‘Herbal Walks’ continue … Aris has now relocated his walks to Vassiliki where you can spend a few hours exploring the abundance of flora in the local area close to the sea. 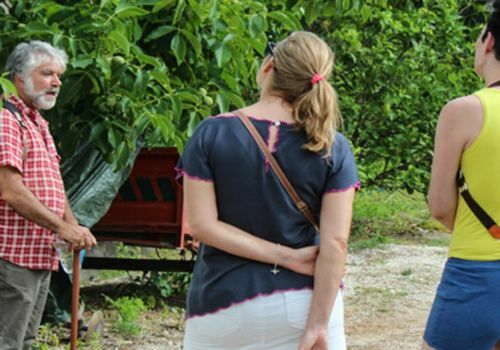 The focus of Aris’ tours is to teach the guests about the abundance of nature and how if they choose to be more in touch with the world around them there are many health benefits to be gained. Many of our guests have fed back to us that the information they have learnt on the walk has influenced them into making small changes to their lives when they return home. Even if it is as simple as using herbal remedies to common ailments or making the decision to live more seasonally. As Aris walks not only does he describe the properties of the herbs and their uses he also tells the stories of the plants and their links to mythology. The Myrtle Bush - The Myrtle bush is considered the sacred plant of goddess Aphrodite. Aphrodite is the goddess of beauty and love, born as a beautiful adult from a sea shell. It is said that Aphrodite sought refuge in her nakedness in a myrtle bush and she is often depicted where a crown made from the myrtle bush. With any tree sacred to a goddess it is important to examine whether it has a special relationship to the bee. Bees were highly regarded by ancient peoples, not only because they provide honey and pollination, but because like humans they live in highly organized communities. Goddesses of love and beauty are likely to be linked with bees. Myrtle also has some wonderful health properties and culinary uses. Myrtle has some highly effective antimicrobial, anti-inflammatory and astringent qualities, which makes it valuable in the treatment of many respiratory ailments and skin issues. The plant contains high levels of salicylic acid (a compound related to aspirin) and is an expectorant (helps to get rid of mucus), which makes myrtle tea an excellent choice for colds and flu. Myrtle essential oil is especially prized, often applied together with other essential oils. In the kitchen Myrtle leaves can be used for flavouring soups in the same way you would use bay leaves. The berries can be used to compliment chicken fish and meat dishes and also turned into jam. Myrtle is just one of the many plants that you will learn about, smell and taste on our unique Herbal Walks. At the moment the Herbal Walk experience is only available at our Vassiliki site, however if you join us for our river trip through the Acheron River you will also meet with another Greek herbal enthusiast who has an array of herbal teas for you to sample. At the side of the river where the spring water rises there is a simple stall with a menu board offering a wide range of herbal teas made with herbs sourced from the local mountains and clear, pure water straight from the spring. 18 März 2019 Is May the month to see the very best of Greece? 12 Februar 2019 Why solo travellers love to visit us! 02 Januar 2019 It’s that time of year again….